As automation takes over manufacturing jobs, a single mom chooses to adapt instead of being left behind. In this inspirational video, she finds the motivation to rise above her circumstances, reinvent herself with updated skills and become more relevant in today’s workforce. via llbOnline: University of Phoenix pays homage to cultural icon Rosie the Riveter today in a new brand campaign by 180LA that highlights the challenges women face in an ever-changing workplace environment. 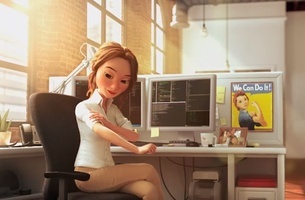 The campaign launches with an animated anthem spot produced by Hornet, 'We can do IT,' that shows a working mother being displaced by technology. Inspired through a modern-day treatment of Rosie the Riveter’s image and message – We Can Do It – the woman earns a University of Phoenix Bachelor of Science in Information Technology degree that helps her to move into the IT field. The 60-second spot launched during NBC’s The Voice Finale and will also air on other broadcast and cable networks as well as through streaming/digital video. The music track in the animated piece is a cover of the 1990’s hit song, Dreams. The lyrics were reworked to evoke an aspirational and motivational message. The four-month initiative also includes: TV (30 and 60 seconds), social films documenting real-life reinvention stories; radio and digital advertising; and social engagement through University of Phoenix social media channels. University of Phoenix is committed to supporting diverse working learners as they upskill to keep up with today’s rapidly changing environment. Recently released data about University of Phoenix students from the 2015 Academic Annual Report, shows that 76 percent work while earning degrees, 67 percent have dependents at home, 45 percent are underrepresented minorities and 60 percent are first-generation college students.